Chills, brutha, chills! That is an extremely haunting visual, full of mood and charnel suspense. It incorporates all of the macabre punch of a Kelley Jones' piece with the soulful eye for characterization that is the trademark of a Samnee original. Simply astonishing! really love how you handled the inking on the vortex. i'm just going to sytart printing these out and putting them in a folder called "Inking Moves to Steal from Chris Samnee"
If it helps, I call that technique "dry-brush and some squirrely junk". Jeez laweez, Chris. Looks like the Windy City Comicon was the place to BE for Samnee commissions. Neal Adams would be proud of this rendering, I'm sure. And by ''proud'', I mean he'd probably soil himself, as I just did. 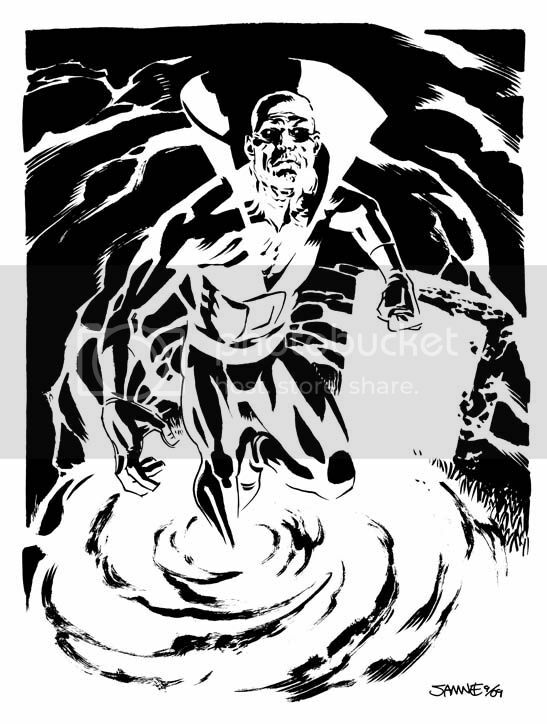 Awesome Deadman, you really brought a cool erie feeling to the piece. A cover worthy image!